This entry was posted on October 30, 2014 at 1:00 am and is filed under Thursday Tangents. You can follow any responses to this entry through the RSS 2.0 feed. You can leave a response, or trackback from your own site. …Damnation Alley? (And its distant relative Hardwired) and Harlan Ellison’s Along The Scenic Route leap to mind. And Mr. Zelazny’s appreciation of the motor vehicle continues in one of my favorite novels, Roadmarks … although the main character in that one drives the classic American vehicle, the pickup truck. I’ll have to think about it for a while to remember any other good ones. Of course, my twisted mind goes immediately to the Transformers and mecha, in the Macross and other series. I suppose cartoons don’t count as SFF, do they? Is genre defined by content or by the demographics of the audience? Chad… I’d say “content,” and certainly the romance of the vehicle is extended in much anime. Mecha, though, are mostly war machines, and that’s a whole different ball of wax. As for “demographic” — I don’t know what you think the demographic for anime/manga is, but it isn’t just teenboppers. I’m WAY out of that range and I’ve been an anime/manga fan for as long as I could lay my hands on the stuff — an extension of my love for good animation and the joy of discovering that there are some amazingly complex stories there, too. Stephen King’s horror novel and movie, “Christine,” about a sentient car, and the TV series “Knight Rider” (maybe even some incarnations of the Batmobile) come to mind. And there was Theodore Sturgeon’s “Killdozer” (I think that may have been a TV movie at some point), not exactly a car but an alien-possessed vehicle. I’m glad to know that someone else out there remembers Supercar. I used to watch it too, and every now and then lines from the theme song start running through my head! I even saw an entry for a DVD collection of the series in a catalog we get, so its still available out there for the true fans. 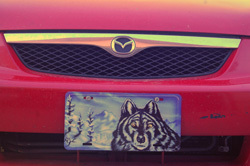 Speaking of License Plates – All Wyoming Plates have a numeric designation (County Code) indicating what county the vehicle is from in addition to the rest letters and numbers on the plate. That way one can tell at a glance if the car was from Albany County (05), Laramie County (02 – including the capital Cheyenne), etc. I liked the flying car that Christopher Lee used in the “Man with the Golden Gun” Bond.